Editor: Günter and Leonore von Zadow, publication date: 2004-05, continuo realisation: Angela Koppenwallner, source: RISM: D-WD 51 etc. 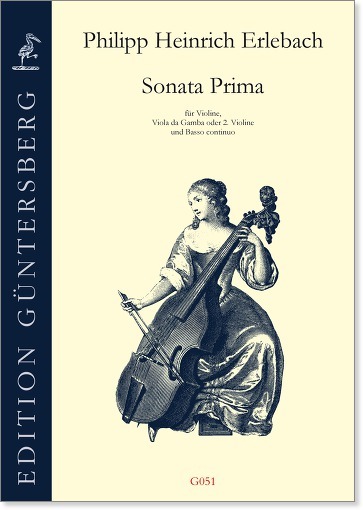 The significance of these Sonatas for the German viola da gamba repertoire was already emphasized by Alfred Ein-stein in his highly regarded dissertation of 1905, in which Erlebach's Sonata Seconda was printed in its entirety. 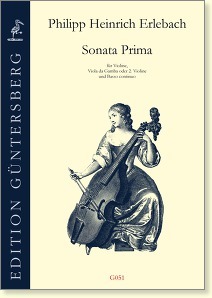 The Sonatas are in the style of an Italian Sonata da camera a tre and show stylistic affinity to Legrenzi, Vitali and Corelli. In these Sonatas Erlebach succeeded in combining the Italian feeling for form and melodic expression with German intellectual depth and sound compositional technique. Historically they lie between Rosenmüller and Buxtehude. As opposed to other similar works of that period the three instrumental lines are of equal importance and autonomy, making a true three-part composition. If applicable, the parts in scordatura are included as well. The parts of the basso continuo have been reworked. They now contain the figures as well. To view and print please click on the desired part.